Reducing non-productive set-up time on manually operated equipment is by far the most effective way to increase productivity, increase machine capacity, and reduce overall production costs. By the nature of their operations, press brake equipment in particular are highly visible contributors of this kind of inefficiency, due to the different tool setups required and the variety of programs that must be processed each day. Set-up time is the most time consuming element in press brake operations simply because it is both a manual and a sequential operation. For this reason it is important that any and all set-up processes are looked at carefully. The goal is to increase the available bending time and reduce the non-productive process of set-up time. Implementation of offline programming is a major step towards reducing the non-productive time at the press brake. With offline programming, as the programmer creates the programs either from 3D models or from drawings, the exact punches and dies will also be taken into consideration for determining the application of the correct bend deduction and the overall dimension of the flat blank. The programmer can also simulate the bending sequence to make sure there are no collisions before the program is sent to the press brake. Once at the brake, if the operator wishes to change the order they can still do so by utilizing a drag and drop re-sequencing of the bending order directly on the operator screen. The loading of the correct program is critical; utilizing a bar code reader to load the correct program into the control ensures quality control and speeds up the program loading process. 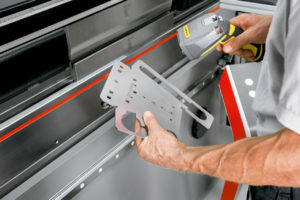 The bar code can be located directly on the job tracking software sheet or laser etched onto the part itself. The control will need to be network capable and also able to accept a bar code scanner as an input device to load programs. First and foremost is the location of the tooling. If the operators have to walk away from the brake to get the tooling, this adds considerable non-productive time, as tooling is often heavy and may take several trips to gather all of the required tooling. 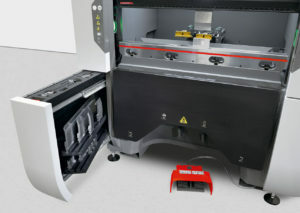 Better to locate the tooling directly within reach of the operator with a roller tooling cabinet or even better, when it is stored directly at the press brake. Secondly, is the use of hydraulic clamping systems for quick change tooling. With these systems, tooling changeover times are very fast, as it takes only the press of a button to release and also to secure the tooling to the press brake ram and table clamping systems. With manual clamping systems, the changeover takes longer as each individual punch and die must be released and then re-secured manually by the operator. Thirdly, another opportunity with tooling setups is to make sure that the bending programs are sequenced for the least amount of tooling changeovers. In this way, all of the programs that require a specific tooling set are placed in sequence, reducing the non-productive time required for tool changes. Reducing non-productive set-up time on manually operated equipment is by far the most effective way to increase productivity, increase machine capacity, and reduce overall production costs. Only after an exhaustive analysis of the non-productive times from the time the order is received until it ships, can a valued assessment of the true impact of reducing set-up time be made. Reducing processing times, non-productive times and machine cycle times, contributes to the reduction of the total order turnaround time and one of the keys to competitive differentiation.